Home / Samsung S6 SM-G920T Upgrade Marshmallow V6.0.1 To Nougat V7.0. 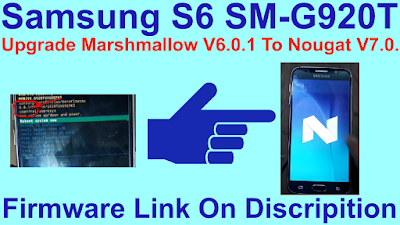 / samsungfiles / Samsung S6 SM-G920T Upgrade Marshmallow V6.0.1 To Nougat V7.0. Samsung S6 SM-G920T Upgrade Marshmallow V6.0.1 To Nougat V7.0. Samsung S6 SM-G920T Update Marshmallow V6.0.1 To Nougat V7.0. Samsung S6 SM-G920T Update Marshmallow V6.0.1 To Nougat V7.0 Required File. 1# Download SM-920T Nougat V7.0 Flash File. S6 SM-G920T Update Marshmallow V6.0.1 To Nougat V7.0 Method. 7# Now open your phone update nougat v7.0.